Some movies stick around for years in the cult market despite being poor movies with not much going for them in terms of plot or entertainment. Blood and Lace is one such movie, a bizarre 1971 thriller starring a vivacious Melody Patterson in one of her only movie roles. She’ll mostly be recognizable to older fans as the actress from the sitcom F Troop. The obscure cult movie is cited as one of the spiritual precursors to the slasher films that would sweep the horror market a decade later. Two more recognizable television actors also have roles in Blood and Lace. 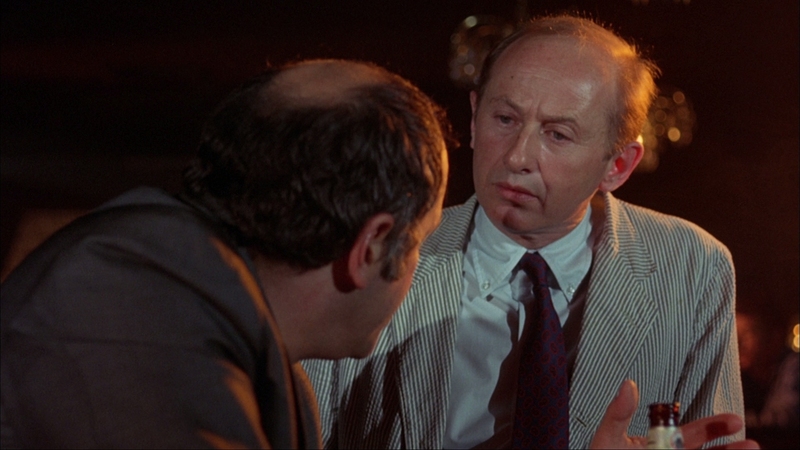 Vic Tayback (Mel from Alice) and a young Len Lesser (Uncle Leo from Seinfeld) have memorable parts as a sleazy detective and a sadistic caretaker. Blood and Lace has such an off-kilter plot that it’s better to focus on its primary characters. The most stylish scene comes in its opening sequence. 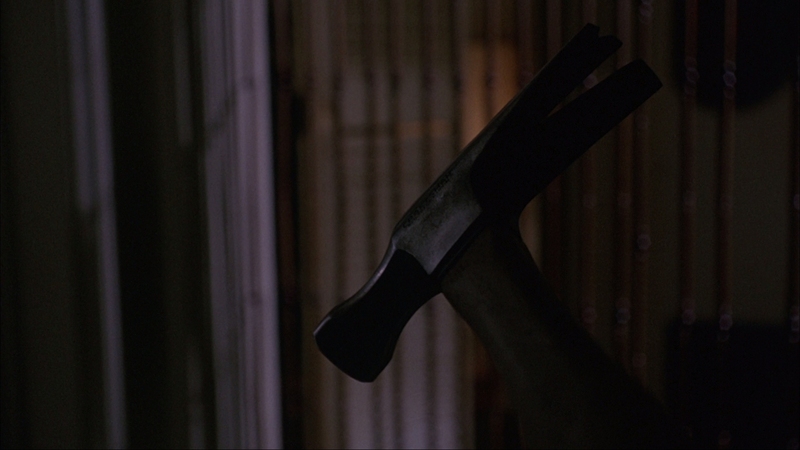 Presaging Halloween’s innovative first person point of view as Michael stalks his prey by nearly a decade, a murderer attacks a sleeping couple in their bed and brutally kills them with a hammer. 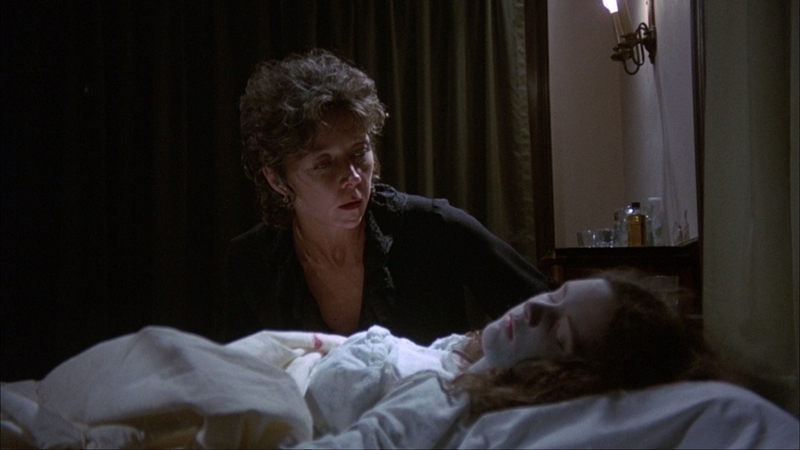 The entire scene is shown from the hammer’s perspective as it nails the victims in their bed. It’s a grisly opening that hits Blood and Lace’s high point as a slasher film. What follows is a twisted story about an orphaned teenager trapped in a sadistic welfare home run by a pair of crooked operators scamming the system. Older teen Ellie Masters (Melody Patterson) is thrown into Mrs. Deere’s orphanage after her mother, the town prostitute, is killed by a hammer-wielding maniac. The beautiful eighteen-year-old draws the lecherous interest of a sleazy detective, Calvin (Vic Tayback). 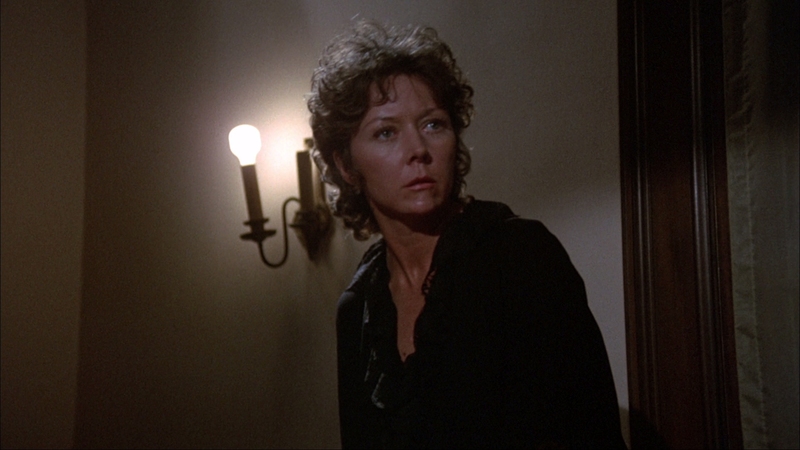 Unknown to Ellie’s social worker, Mrs. Deere (Gloria Grahame) is running the orphanage with an iron fist along with the creepy Tom (Len Lesser). Deere and Tom have been killing off the orphanage’s runaways and storing their bodies in a scheme to keep receiving welfare payments for the dead teenagers. Run like a prison, the orphanage is a nightmarish place to live for Ellie. She suffers nightmares of the hammer that killed her mother and hopes to escape when given the chance. When her mother’s masked killer starts making an appearance around the orphanage, things become even more terrifying. Blood and Lace becomes a tedious thriller despite a rash of crazy plot twists and some unusually gruesome story lines for its time. About the only thing holding it together is a beguiling lead performance from Melody Patterson as the sweetly innocent Ellie getting swept up into all of these crazy events and nutso characters. Practically every male character hits on Ellie at some point, a recurring theme in Blood and Lace. 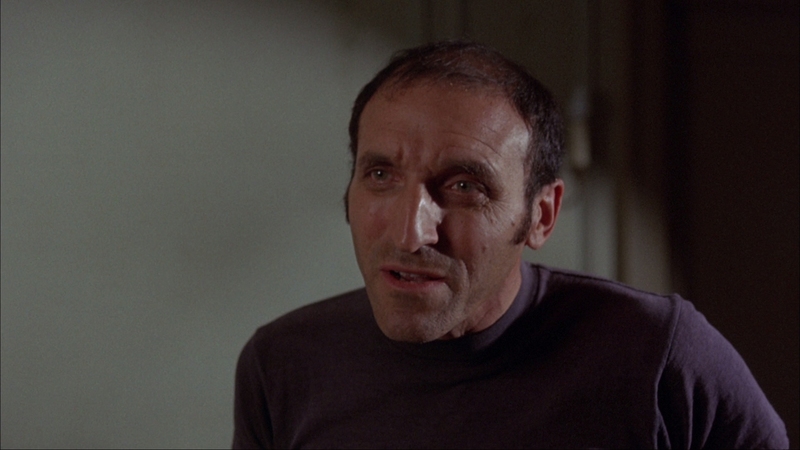 Len Lesser also contributes nicely as the creepy caretaker in league with Mrs. Deere. Some of the teenage actors at the orphanage alongside Ellie are absolutely terrible, giving some scenes an after-school special quality the thriller wasn’t attempting. Like many low-budget exploitation films, this was made quickly and cheaply. The 1971 exploitation film represents the transition from the stately horror of the 1960s into the more shocking, violent films of the grindhouse era. Feeling out of place in both worlds, it’s an uneasy thriller with laughable twists. There is some kitsch value in seeing popular television actors degrade themselves in this kind of material but the slasher barely works as a coherent movie. Scream Factory (a subsidiary of Shout Factory) “rescues” this cult film from the MGM vaults. The low-budget thriller has barely been available on home video in legitimate form so obviously this Blu-ray represents a quantum improvement in video quality over anything seen for it in decades. Blood and Lace is presented in an adequate 1.78:1 presentation at 1080P resolution. Running 86 minutes on a BD-25, the AVC video encode averages 28 Mbps. Aside from some chroma noise that briefly appears, the video is free from compression artifacts. This is a smooth, soft film transfer from questionable film elements, but likely the best one this movie will ever get. Let me state the positives for this film transfer before tearing it down. The print condition is remarkably free of most damage, unblemished in appearance. This is from stable film elements with steady contrast and decent color fidelity. In those basic terms, the transfer is an unqualified success that should please less demanding videophiles. Clarity is fairly high for exploitation material from this period. Scream Factory didn’t have a lot of options for the transfer. Scouring MGM’s vaults produced this older transfer from secondary elements at best, most likely a telecine struck from an early film print. Resolution is extremely soft and rolled off. Some filtering has almost certainly been applied, leaving optical ringing and shaving off fine detail. I don’t think Scream Factory is to blame. This appears to coincide with MGM’s older vault practices in the past decade for HD transfers. The entire movie is soft with a suspicious lack of expected grain structure. While it’s definitely not as poor as an upscaled film transfer from SD sources, the dated HD transfer produces very questionable fine detail for vintage film stock. The monaural mix is presented in an oddly distant 2.0 DTS-HD MA soundtrack. Showcasing a score full of stock library music and a mish-mash of odd effects, it sounds recessed and thin. Fidelity isn’t terrible but the sound design lacks any bass whatsoever. It hits you like a wet noodle when you most expect more sonic impact. Dialogue is extremely soft, leading to somewhat unintelligible passages unless the volume is pushed beyond a comfortable range. Scream Factory provides their usually distinctive reversible cover art with striking original poster art for the film. Commentary by Film Historian Richard Harland Smith – This solo commentary is well-researched and packed with extensive information about the cast and crew. Smith likes pointing out the influences seen in the film and which films were inspired by it. 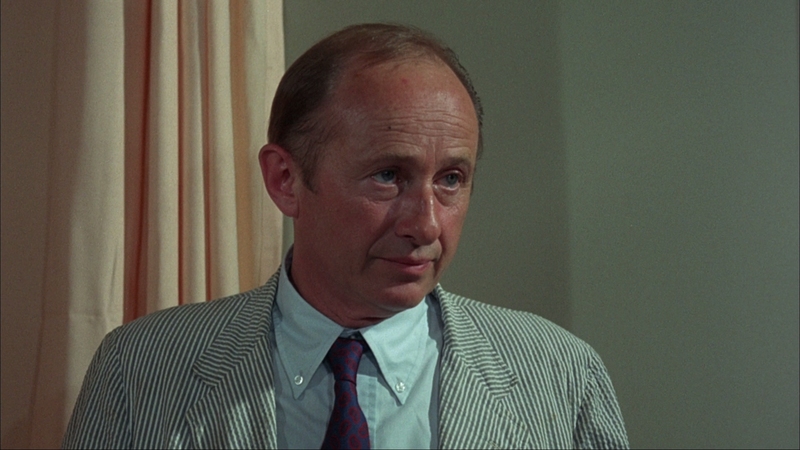 He does keep his commentary running fairly continuously, few pauses are included for the entire film.